The Minnesota Vikings have a new home in Minneapolis; downtown Duluth has a changed skyline; Shakopee now hosts a sprawling Amazon fulfillment center; and the Capitol in St. Paul sports its first new neighboring legislative building since 1932. Finance & Commerce named 33 Top Projects, including Beacon Hill. Beacon Hill grew from a partnership between Itasca County Health and Human Services, Itasca County Housing and Redevelopment Authority, GRACE House shelter, Northland Counseling Center Inc., the Minnesota Department of Corrections, Itasca County Probation and KOOTASCA Community Action. With 20 apartments and 28 townhouses, Beacon Hill serves a diverse mix of more than 120 tenants in Grad Rapids. 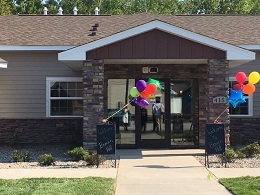 “The fact that you have family housing, formerly homeless housing and housing for people with disabilities, that’s incredibly inclusive,” said Warren Hanson, president of the Greater Minnesota Housing Fund. For example, the complex has 10 apartments dedicated to disabled homeless individuals and serving their needs, from rental assistance to 24/7 client-centered care plans from mental health professionals. Meanwhile, Beacon Hill officials said their townhomes have some attractive features, such as patios and high-speed internet connections, that aren’t always found in multifamily projects. Beacon Hill officials said the development is unusual because of its support from a diverse group of agencies, from corrections to mental health. In 2013, HHseven Itasca County leaders assembled to participate in the Housing Institute, an initiative of the Minnesota Housing Partnership to bring new affordable housing to Grand Rapids. During the 13-month process, the team met more than 50 times to identify housing goals, research types of supportive housing, and work on Beacon Hill project details. One result of the Beacon Hill collaborations: Inmates from MINNCOR Industries, the state’s prison industry, made all of the project’s bathroom, kitchen and front-desk cabinetry. The federal Department of Housing and Urban Development granted a waiver to allow that work to be done. Read about all 33 Top Projects at Finance & Commerce.